It was given to my church as a thank you gift for all their help while my husband was going through treatment for a rare cancer. I really didn't have the skills then to be fully pleased with the result, but I sure learned as I went. It is loosely based on the church's logo. It was fun and challenging to quilt all these different designs. I knew I wanted to remake it but make it more personal to my journey while my hubby was fighting cancer. You really can't see the positive words I quilted on the jug of the 2nd version. I did a watercolor of them for my friend Robin. I met her online during this time and I got to have a quilty getaway at her home while I was working on Poured Out 2. Robin and I with the partially quilted version. Here's the whole version. It's incredibly hard to get a good photo of this quilt! The color has been tweaked so you can see all of the words. Only the outline of the words, the figure, the thorn vines, and the spines of the feathers were marked, everything else was freehand. 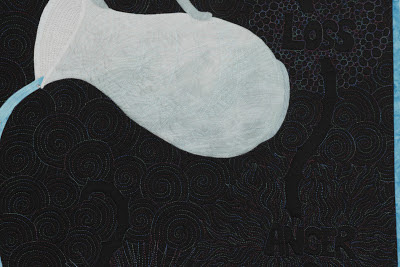 The background is a black sateen and the words are created by densely quilting around them with varigated thread in a blue, purple, green, and maroon red. I entered it into the Sacred Threads Exhibit in Herendon DC. This was the first time I entered anything. Below, I am in front of the quilt at the exhibit. That's also the first picture of me I was pleased to put on the internet of me. I was contacted by Magnet magazine from the UK and they wanted to use the quilt in their magazine to illustrate an article. It was so much fun to feather all of the water! This quilt really started me off on a quilting adventure I had never really thought could happen. It gave me courage to "put myself out there" and enter Sacred Threads, get in a magazine, and make myself more known as a quilter in my local area. A friend asked to hang it in her church for a month which led to an article in our little weekly paper. It's somewhat easier to hide behind the computer screen sometimes, but this got me out of my comfort zone and made some incredible things happen, like quilting for others and teaching. For more fabulous quilty inspiration, go visit the Blogger's Quilt Festival! it is an amazing quilt Amy! Gorgeous quilt and quilting on both quilts! I love the words surrounded by different quilting patterns. My best friend died of a pediatric bone cancer (at 27) last year, and it continues to inspire quilts for me. I love the way you captured what cancer is for so many people--even when the outcome is the best possible. Such a beautiful piece! Thank you! It was therapeutic. I am sorry to hear you lost your friend to this horrible disease. Thank you. It was definitely theraputic. Each time I see this quilt (in person or in pictures) I am so impressed with not only your magnificent quilting, but the symbolism captured so beautifully in the quilt. Christ surely did pour Himself out for us. I can totally envision how He covers and soothes all those pains and hurts in our lives. Shall I bring it down in November? He is awesome, isn't He? Thank you so much my encouraging friend! He definitely had a hand in making this quilt, from the very beginning, fitting, as He led us through that time. These are both amazing quilts! The workmanship and intent behind are beautiful. Lovely! Thanks! I’m just happy to share it and to actually have my act together enough to finally enter the Blogger’s Quilt Festival! Beautiful quilting...great you put an entry in. I had come across your blog before...loved it, then lost it and there you are again. Will have to follow somehow as I am equally hooked on FMQ and love looking at other people's adventures with FMQ.. Here I am! Glad we found each other. Thank you. Thank you for sharing this truly heartfelt quilt. Your quilting skills are amazing and the results are inspiring. Amazing quilt! Love sure was poured out when making this quilt! Congrats on the publications! You have done an amazing job its awesome!! Wow! 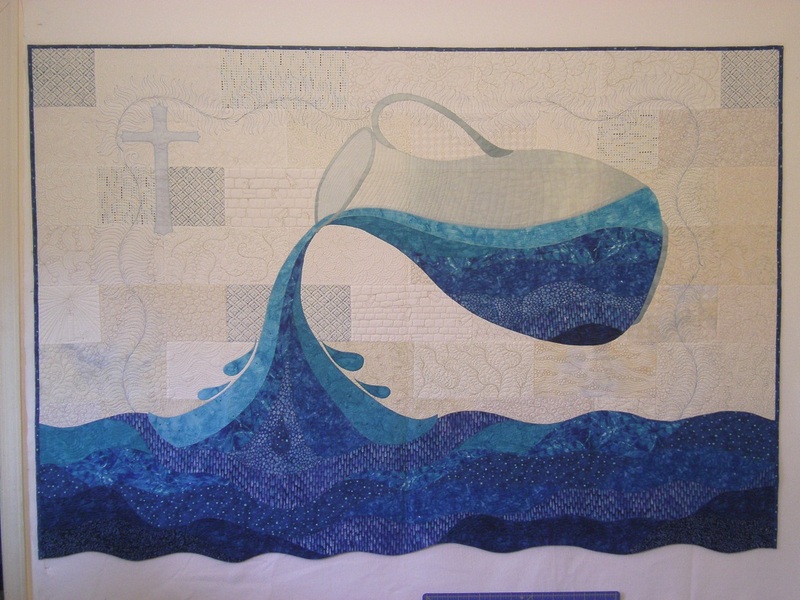 Gorgeous quilting and such a moving tribute to a painful time in you and your husband's life. Absolutely stunning quilt - marvellous free motion quilting! Such a fabulous quilt! I am always enriched by the power of our stitching, for us and for others! Your designs are so wonderfully fluid, and I always love to see such detail in the quilting; beautiful work! Great detail in your quilting! Love the story behind it as well. Wow - what a gorgeous quilt - thanks so much for sharing your story and your process. This is beautiful and really speaks to me. I was wondering if you have a pattern for this quilt? Susan, I hope you see this. I'd reply directly, but you're a no-reply blogger. There is no pattern available as of yet. You aren't the first person to ask though so I may release a simplified pattern in the future.